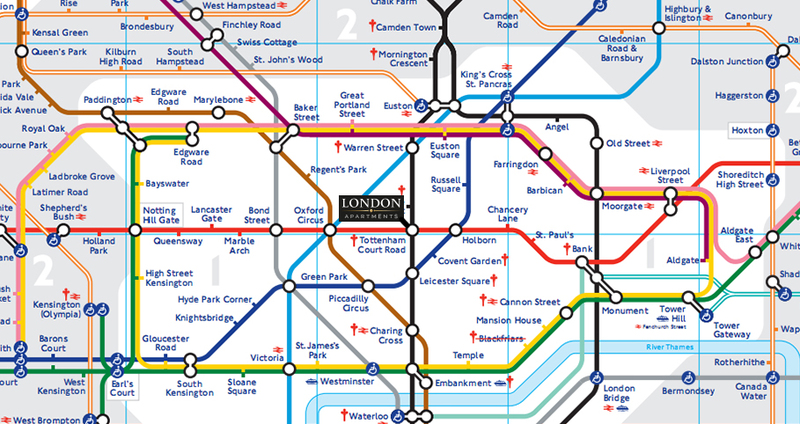 It is hard to imagine a better, more central, or more convenient location for exploring London. Less than 100 m from Tottenham Court Road underground station and the intersection of the Central and Northern Lines the apartment is directly linked by five or less “tube” stops to all of London’s major railway stations except Paddington. This last station, and all four major airports (Heathrow, Gatwick, London City and Stansted), can all be reached easily and quickly with a single change. Taxis are readily available on the street outside the property but most London landmarks are within easy walking distance (see below) and much of the time you will find taxis and public transport unnecessary. Occupying the 3rd and 4th floor of a Soho townhouse, “the Penthouse” has a door opening directly onto the street, an entryphone system and a dedicated private stairway. Surrounded largely by offices, being double or triple glazed throughout, and with the owners flat separating the Penthouse from the bar on the ground floor the apartment is remarkably quiet and peaceful given its location in this vibrant neighbourhood. Enjoying views of Soho Square at the front and with a leafy aspect and un-overlooked rooftop terrace with to the rear, the Penthouse is an ideal (perhaps idyllic) location from which to enjoy this wonderful historic city.